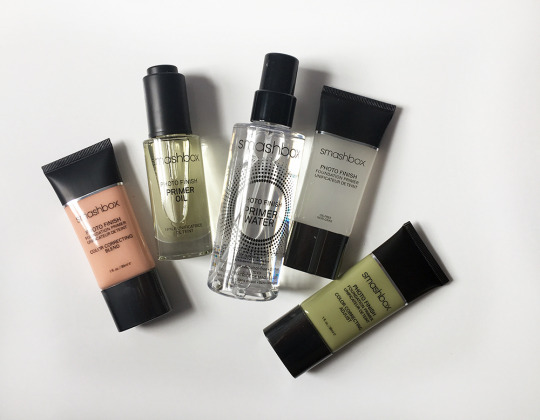 It's possible that Smashbox invented primers - if not, they're doing an amazing job of constantly reinventing them. The thing is, I am straight up scared of most priming products. My skin is very acne prone and very combination - oily and dry patches - and I feel like a lot of primers make me look either overly greasy or bring out fine lines and dryness. Enter the Photo Finish Primer Water. Mist for a light (<- keyword) layer of hydration and priming power that holds makeup tight. If you aren't spritzing your face first thing you are really missing out because it's the most invigorating experience to wake up to. Ok, maybe not THE most but ... in your skincare life. If this doesn't apply to your skin type, check the line up: Photo Finish Foundation Primer is the cult classic and bonus, you can use it to tame frizz in your hair (true story). If you dislike the redness in your skin or have breakout or scarring areas Photo Finish Color Correcting Primer in Adjust is dreamy - and does not make you look green, swear. If you're not so much red as uneven, or if you want an all-in-one product that lets you possibly ditch your foundation - try the Photo Finish Color Correcting Primer in Blend. And lastly - and amazingly, since the dry Fall/Winter months are coming - they also make a Photo Finish Primer Oil. I love this for pre-event and post-flight prep when you really do need to smooth things out with moisture and get that deep glow. And no - the oil does not make your makeup slide off, the magic is in there too!